A supporter died after violent clashes between fans before Atletico Madrid's home match against Deportivo La Coruna. The unnamed Deportivo fan, 43, was taken out of a river near Atletico's Vincente Calderon Stadium suffering from cardiac arrest, hypothermia and head injuries and died in hospital. Eleven other people were treated for mostly minor injuries, including a female police officer. Twenty people were taken into custody with 100 troublemakers identified. 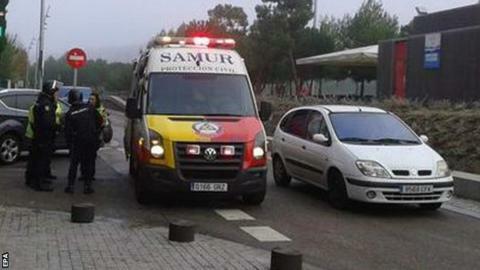 The violence near the stadium was condemned by both clubs and the Spanish league. Atletico chief executive Miguel Angel Gil Marin was outspoken in his condemnation. "It's disgusting - that scum has no place in football," he said. "I only hope they identify those responsible and they can't repeat such deplorable acts as these." Atletico president Enrique Cerezo, speaking before the death of the supporter was announced, told Spanish television: "I want to say that this has nothing to do with football. "These are radical groups who meet up and these are the consequences." Deportivo president Tino Fernandez said clubs needed to do more to make sure such incidents were not allowed to happen. He added: "It's tragic news. I want to express our vehement opposition to violence." After the match, Depor coach Victor Fernandez added: "It's one of the saddest days in Spanish football in recent years. They are reprehensible and despicable acts." Atletico Madrid won 2-0 to record their fifth win in six games and move within four points of La Liga leaders Real Madrid. Saul Niguez headed the defending champions in front in the 43rd-minute before Arda Turan sealed victory 10 minutes into the second half. The win took Atletico into second place in the table before Barcelona's evening kick-off away to Valencia.